January 10, 2003 - The first three installments in the Panzer Dragoon series are almost legendary in gaming circles. Released for the Sega Saturn, Panzer Dragoon, Zwei, and Saga became some of the coolest titles in the gaming underground. Never really mainstream, the series is almost mythical within the gaming community. Far more people talk about Panzer than have actually played any of the titles. As Sega continues to reach into their vault of past licenses, Panzer Dragoon Orta arrives to perhaps the widest American audience yet for the Panzer series. A shooter with a solid storyline, stunning graphics, and great sound, Panzer Dragoon Orta looks to carry on the tradition of its predecessors. For many, this will be their first real introduction to the series. But don't worry, Panzer novices can still enjoy the game and those who played the earlier versions will almost certainly be pleased. Panzer Dragoon Orta is the perfect way to start the new year and is the best rail shooter of all time. Period. 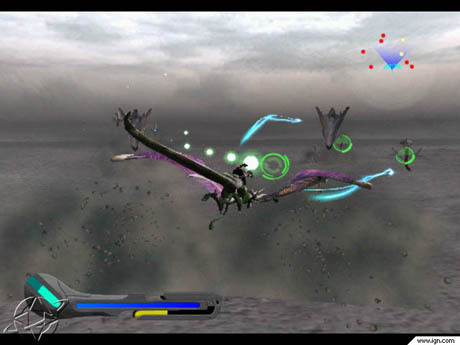 Panzer Dragoon Orta is a fast-paced, almost non-stop action shooter. But developer Smilebit took the time to also include a solid story. Cut-scenes intermixed throughout the game tell the story of a young girl, Orta, who has been imprisoned for some time. She is broken free from her prison by a mysterious dragon and from there must not only fight the scourge of the Empire, but discover the truth of her own destiny. You can almost completely avoid all story elements in Panzer by pressing start during the cut-scenes. However, if you do so you'll miss out on a well-told story. More importantly, the story gives extra weight to each level. It certainly has a Japanese flavor, but any fan of the earlier Panzers or anyone looking for more than just action, owes it to themselves to watch every well-rendered cut-scene. If the story has one fault, is that it makes me long for a Panzer RPG even more. How great would it have been to have a solid story, great gameplay, stellar graphics, and RPG elements? That would have many folks on cloud nine for a good long time. Panzer Dragoon Orta is a rail shooter, a rare type of game more popular in the '80s and early '90s. They're uncommon nowadays as developers choose to go for more high-concept games, first-person shooters, and adventure titles. A rail shooter means that the game is on a track. While you can aim and move somewhat freely about the screen, you are pushed along a single path, which you must follow. While it may sound limiting, the idea is to let you focus on shooting and not worry about getting lost or making a misstep and falling down a pit. While Panzer Dragoon Orta is on rails, each level has at least one split, where you can take different paths. The path you take simply depends on the direction you point. These splits are not obvious and have no indicator, so you'll have to find them on your own. But these aren't arbitrary path changes. The paths will often put you in different surroundings, fighting different creatures. Some paths may be easier than others, but that's for you to discover. Panzer is heavy on shooting. In fact, you'll have trouble finding many games where you do as much shooting as you do here. But unlike most shooters, where you must always kill to survive, many of the enemies in Orta don't have to be shot in order to progress. The point of Panzer isn't simply to beat a level or beat the game. It's partly about experiencing the sights of Panzer's world and partly about replaying levels to attain better rankings. There are plenty of creatures in Orta you won't have to kill. But if you want a good rating (and you will want one, if this game is going to appeal to you), you'll need to shoot down as many enemies as possible. That's, perhaps, what makes the Panzer formula so addictive. For all of its beauty and dazzle, the gameplay is pretty simple. You destroy and you try to avoid dying. There are no pits to leap over, no puzzles to solve. Your goal is to shoot down as many enemies as possible. Orta is, essentially, a throwback to old school gaming when a game only took a few hours to pass, but the gameplay was so addictive that you played it again and again. Like Frogger, Ms. Pac-Man, Super Mario Bros., Contra, or the original Sonic, Panzer Dragoon Orta has an intangible extra that makes it worth playing again and again. The Legend of Chun-Li gets beat-down. Another beauty makes the internet a better place. Rich, refreshing, caffeinated fanboyism you can taste! Start for $9.95 or try for free.